Carly has a story, but she’s not telling us much. She wandered up to a home in south-central TN about 6 months ago, no tags, no chip, not starving, not sick, just lost and on her own. No one seemed to be looking for her, but she fit right in with the finder’s other dogs, including a Yorkie-mix and even got along with the cats. The vet estimates that she’s about 4 years old and had been neglected a long time. She had a couple of tumors that had to be removed; fortunately, they were benign. She had some skin issues that have cleared up with good food and great care (and baths!). She was a bit on the thin side at 55 pounds but is putting on weight appropriately. She probably should be around 65 pounds. Carly is with one of our most-experienced foster moms in Nashville and has made herself at home. She is a very sweet girl, who loves car rides, loves playing with the foster mom’s 1-year-old male Airedale, and wants to be beside you so she gets lots of pets. Carly has a little arthritis in her spine that makes her favor her right back leg, but after a thorough exam and x-rays, the vet said she is fine for regular exercise and long walks, but she wouldn’t be a good candidate for agility games. She probably shouldn’t live in a house where she has to climb stairs a lot. The vet recommends good joint supplements and she’ll be a great companion for a long time. Maybe Carly is the one you’ve been waiting for. Please fill out an application to be considered for Carly. Hi, Gary. Thank you for contacting us. To be considered for adopting one of our Airedales, please fill out an application her on our site under Adopt. Once we receive your application, one of our volunteers will contact you for a telephone interview, which will be followed with a home visit. 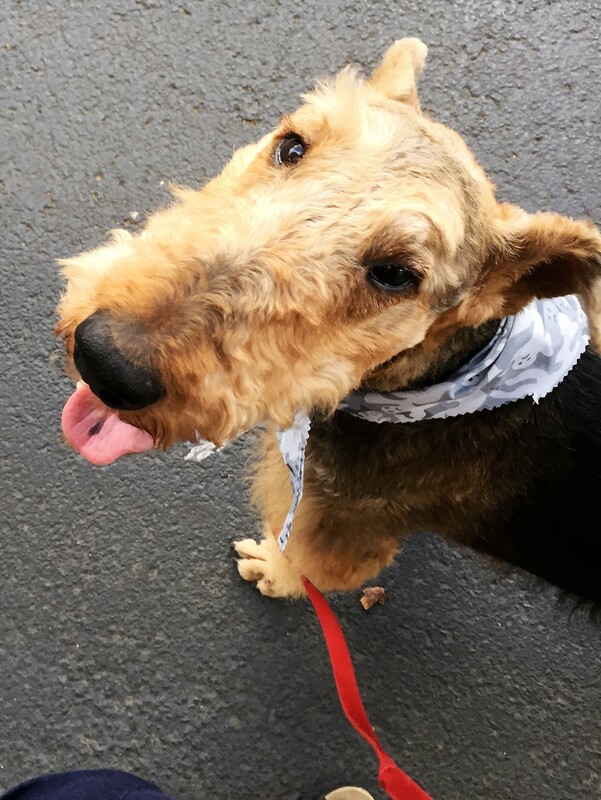 If you are approved to adopt, we will then try to match you with an Airedale that will fit your lifestyle. We look forward to receiving your application. Please be mindful that we are all volunteers, so please be patient with us. I wish you luck in your search for an Airedale. I just filled out an application for her! I Live in Marietta GA. So happy she is in good hands now. Lydia from rescuewelsh post about the transportation problem. Hope you found someone… let me know. Thank you, Marcela. We have received your application and noted your generous offer to help. One of our volunteers will be in touch soon to discuss your application and next steps in our process. Thank you. Any update in her status? Marcela, Carly is at our vet’s office and is being evaluated. She has a skin infection that they have not yet identified. We’ll update her status as soon as we know more. Oh no! Poor baby. Thank you. Thanks, Marcela. We appreciate your concern. Hi Jackie- Sara here. Haven’t gotten settled in my new home yet but Carly is adorable. Is she still available? I have filled out an application but have yet to receive a confirmation or response? Thanks so much. Honestly. Totally patient. Just wanted to make sure someone received it. Thanks for taking the time and quick response. Is Carly still available for adoption? We filled out an application October 8th. Just wanted to check in that it was received. We are very eager to continue the process so we can welcome a new member to our family. We are in Spartanburg, SC and have met Andrew, Caleb and Coltrain. Andrea has kindly agreed to be our reference. Hi, Yana. Thanks for following up. I know that one of our volunteers is going to contact you. I’ll give them a nudge. Thanks for your patience. Thank you for getting back to me. My older son in particular is so looking forward to getting a family pet. He’ll be thrilled to hear that one of your folks will be giving us a call soon. Look forward to working with you organization. I’m going to call you now! Would love to meet Carly if she is still available. My much loved airedale recently passed away. Hope to hear back from you soon. Hi, Lynda. I’m sorry to hear that you’ve recently lost your Airedale. It is so hard when one of our beloved friends crosses over. Carly has not been adopted yet though she does have people interested. If you are in our region, NC, SC, TN, GA, or AL, please fill out an application on this site under “Adopt” and submit it and one of our volunteers will contact you. After a telephone interview, we then will require a home visit. All of this is necessary before you can be approved to adopt. We look forward to receiving your application. any update on Carly? I had filled out an application and wondered if she has been adopted. Hi, Lynda. Carly is promised to someone and we are just working out the logistics and timing. Your application is in the pipeline. Our 15 year old female diabetic rat terrier(Daisy) just passed away. We still have a 13 old rat terrier(Bo) who misses Daisy very much. My husband has always wanted an Airedale. We were interested in Carley but think she has already been adopted. We live west of Knoxville, TN. Please help use find a female Airedale to come to our home and help Bo not be so lonely. Hi, Karen. I’m sorry your rat terrier had to say goodbye. It’s so hard. To be considered for adoption, please fill out an application on this site (Adopt), and one of our volunteers will contact you. Thank you for contacting us.